FedEx requires a phone number in the event that they have difficulty locating your business or residence. We are unable to ship Christmas Wreaths to PO Boxes, APO, FPO U.S. Possessions or international addresses. When does Stone Family ship its products? We ship Christmas Wreaths from mid November right up to five days before Christmas. This allows us to deliver the freshest Christmas Wreath possible to your door - Wreath that will last throughout the Holiday season. 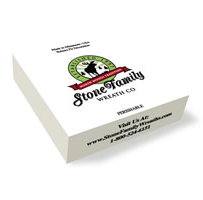 How do I order Stone Family Gifts? For individual or multiple Christmas Wreath ordering, click the order button you’ll find by any Christmas Wreath product. Be sure to include your shipping information. If you’d like a Christmas Wreath gift message, please include that information. Corporate Christmas Wreath customers can add multiple addresses during checkout. We’ll do everything to ensure your friends and associates will receive their Christmas Wreath gift promptly and professionally. How are Stone Family Christmas Wreath Gifts made? All Stone Family Wreath selections are enclosed in plastic and sprayed with water to retain its moisture. The balsam Christmas Wreath is then carefully packaged in a crush-proof custom-designed box, to ensure your satisfaction upon delivery. 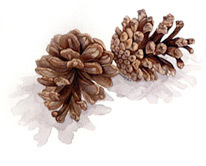 After we receive your order your Balsam Fir Evergreen wreath will be made from fresh Balsam Fir boughs. Each wreath is hand trimmed and decorated with care. We’ll print your gift message, and it will be ready for shipment per your request. How are my gifts packaged? All Stone Family Wreath selections are enclosed in plastic and sprayed with water to retain its moisture. The balsam Christmas Wreath is then carefully packaged in a crush-proof custom-designed box, to ensure your satisfaction upon delivery. How are my gifts shipped? All Stone Family Christmas Wreaths are shipped individually in a custom designed box with free gift message option. Your Stone Family Christmas Wreath order will we shipped immediately through Federal Express. Or, you can specify a later shipping date with your order. Christmas Wreaths are typically delivered via Federal Express in 1 to 6 Days from shipment date. Shipping and Handling charge will apply for FedEx address corrections. Minnesota residents will be charged 7.875% sales tax on purchases. We offer the best technology in tracking your order. After completing your order on-line, you will receive an e-mail confirmation that your Christmas Wreath has been shipped along with a tracking number. Just click on the tracking number and the location of your Christmas Wreath will be displayed. Note: Please check your address very carefully! An additional $12.50 charge will be added for FedEx address corrections. We are unable to ship to PO Boxes, APO, FPO U.S. Possessions, or international addresses. Deliveries to states that require agricultural inspections may require an additional 2-3 business days. An additional $29.00 shipping and handling charge for Alaska and Hawaii orders. What is the Stone Family Return Policy? Our Christmas Wreath are guaranteed to give 100% satisfaction. Return anything purchased from us if it proves otherwise. We will replace it, refund your purchase price or credit your credit card. We do not want you to have anything from Stone Family Wreath Co. that is not completely satisfactory. If you receive a Christmas Wreath from Stone Family Wreath Company that is damaged or in a condition that is not acceptable, return the product through US Postal Service or FedEx. Will you protect my privacy? Stone Family Wreath Company does not collect any personal information about you unless you specifically and knowingly provide it. Examples include your name, mailing address, e-mail address. We use your IP address to help diagnose problems and to administer our Web site. We also use it to identify you and to gather broad demographic information. For more information, please visit our privacy page. We will also keep confidential the name and addresses of your recipients. Is my ordering and personal information secure? Stone Family Wreath Company has security measures in place to protect the loss, misuse and alteration of the information under our control. We use technology to protect your sensitive personal information stored and while being transmitted over the Internet. For more information, please visit our privacy page.